Between two to three million people in the United States have glaucoma, and 120,000 of those are legally blind as a result. It is the leading cause of preventable blindness in the United States and the most frequent cause of blindness in African-Americans, who are at about a three-fold higher risk of glaucoma than the rest of the population. The risk of glaucoma increases dramatically with age, but it can strike any age group, even newborn infants and fetuses. Glaucoma can be classified into two categories: open-angle glaucoma and narrow-angle glaucoma. To understand what glaucoma is and what these terms mean, it is useful to understand eye structure. Eyes are sphere-shaped. A tough, non-leaky protective sheath (the sclera) covers the entire eye, except for the clear cornea at the front and the optic nerve at the back. Light comes into the eye through the cornea, then passes through the lens, which focuses it onto the retina (the innermost surface at the back of the eye). The rods and cones of the retina transform the light energy into electrical messages, which are transmitted to the brain by the bundle of nerves known as the optic nerve. 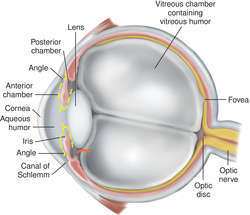 The iris, the colored part of the eye shaped like a round picture frame, is between the dome-shaped cornea and the lens. It controls the amount of light that enters the eye by opening and closing its central hole (pupil) like the diaphragm in a camera. The iris, cornea, and lens are bathed in a liquid called the aqueous humor, which is somewhat similar to plasma. This liquid is continually produced by nearby ciliary tissues and moved out of the eye into the bloodstream by a system of drainage canals (called the trabecular meshwork). The drainage area is located in front of the iris, in the angle formed between the iris and the point at which the iris appears to meet the inside of the cornea. Glaucoma occurs if the aqueous humor is not removed rapidly enough or if it is made too rapidly, causing pressure to build-up. The high pressure distorts the shape of the optic nerve and destroys the nerve. Destroyed nerve cells result in blind spots in places where the image from the retina is not being transmitted to the brain. Open-angle glaucoma accounts for over 90% of all cases. It is called "open-angle" because the angle between the iris and the cornea is open, allowing drainage of the aqueous humor. It is usually chronic and progresses slowly. In narrow-angle glaucoma, the angle where aqueous fluid drainage occurs is narrow, and therefore may drain slowly or may be at risk of becoming closed. A closed-angle glaucoma attack is usually acute, occurring when the drainage area is blocked. This can occur, for example, if the iris and lens suddenly adhere to each other and the iris is pushed forward. In patients with very narrow angles, this can occur when the eyes dilate (e.g., when entering a dark room, or if taking certain medications). Congenital glaucoma occurs in babies and is the result of incomplete development of the eye's drainage canals during embryonic development. Microsurgery can often correct the defects or they can be treated with a combination of medicine and surgery. One rare form of open-angle glaucoma, normal tension glaucoma, is different. People with normal-tension glaucoma have optic nerve damage in the presence of normal IOP. As of 1998, the mechanism of this disease is a mystery but is generally detected after an examination of the optic nerve. Those at higher risk for this form of glaucoma are people with a familial history of normal tension glaucoma, people of Japanese ancestory, and people with a history of systemic heart disease such as irregular heart rhythm. Glaucoma is also a secondary condition of over 60 widely diverse diseases and can also result from injury, inflammation, tumor, or in advanced cases of cataract or diabetes. The cause of vision loss in all forms of glaucoma is optic nerve damage. There are many underlying causes and forms of glaucoma. Most causes of glaucoma are not known, but it is clear that a number of different processes are involved, and a malfunction in any one of them could cause glaucoma. For example, trauma to the eye could result in the angle becoming blocked, or, as a person ages, the lens becomes larger and may push the iris forward. The cause of optic nerve damage in normal-tension glaucoma is also unknown, but there is speculation that the optic nerves of these patients are susceptible to damage at lower pressures than what is usually considered to be abnormally high. It is probable that most glaucoma is inherited. At least ten defective genes that cause glaucoma have been identified. At first, chronic open-angle glaucoma is without noticeable symptoms. The pressure build-up is gradual and there is no discomfort. Moreover, the vision loss is too gradual to be noticed and each eye fills-in the image where its partner has a blind spot. However, if it is not treated, vision loss becomes evident, and the condition can be very painful. On the other hand, acute closed-angle glaucoma is obvious from the beginning of an attack. The symptoms are, blurred vision, severe pain, sensitivity to light, nausea, and halos around lights. The normally clear corneas may be hazy. This is an ocular emergency and needs to be treated immediately. Similarly, congenital glaucoma is evident at birth. Symptoms are bulging eyes, cloudy corneas, excessive tearing, and sensitivity to light. Intraocular pressure, visual field defects, the angle in the eye where the iris meets the cornea, and the appearance of the optic nerve are all considered in the diagnosis of glaucoma. IOP is measured with an instrument known as a tonometer. One type of tonometer involves numbing the eye with an eyedrop that has a yellow coloring in it and touching the cornea with a small probe. This quick test is a routine part of an eye examination and is usually included without extra charge in the cost of a visit to an ophthalmologist or optometrist. Ophthalmoscopes, hand-held instruments with a light source, are used to detect optic nerve damage by looking through the pupil. The optic nerve is examined for changes; the remainder of the back of the eye can be examined as well. Other types of lenses that can be used to examine the back of the eye may also be used. A slit lamp will allow the doctor to examine the front of the eye (i.e., cornea, iris, and lens). Visual field tests (perimetry) can detect blind spots in a patient's field of vision before the patient is aware of them. Certain defects may indicate glaucoma. Another test, gonioscopy, can distinguish between narrow-angle and open-angle glaucoma. A gonioscope, which is a hand-held contact lens with a mirror, allows visualization of the angle between the iris and the cornea. Intraocular pressure can vary throughout the day. For that reason, the doctor may have a patient return for several visits to measure the IOP at different times of the day. When glaucoma is diagnosed, drugs, typically given as eye drops, are usually tried before surgery. Several classes of medications are effective at lowering IOP and thus preventing optic nerve damage in chronic and neonatal glaucoma. Beta blockers, like Timoptic; carbonic anhydrase inhibitors, like acetazolamide; and alpha-2 agonists, such as Alphagan, inhibit the production of aqueous humor. Miotics, like pilocarpine, and prostaglandin analogues, like Xalatan, increase the outflow of aqueous humor. Cosopt is the first eyedrop that is a combined beta blocker (Timoptic) and carbonic anhydrase inhibitor and may be helpful for patients required to take more than one glaucoma medication each day. The Food and drug administration recently approved two new prostaglandin-related drugs, Travatan and Lumigan on March 16, 2001. These drugs work by decreasing intraocular pressure and may be considered for people with glaucoma that are unable to tolerate other IOP lowering drugs. Additionally, Travatan may work best for African-Americans with glaucoma (a population at high risk for glaucoma). It is important for patients to tell their doctors about any conditions they have or medications they are taking. Certain drugs used to treat glaucoma should not be prescribed for patients with pre-existing conditions. Some of these drugs mentioned have side effects, so patients taking them should be monitored closely, especially for cardiovascular, pulmonary, and behavioral symptoms. Different medications lower IOP by different amounts, and a combination of medications may be necessary. It is important that patients take their medications and that their regimens are monitored regularly, to be sure that the IOP is lowered sufficiently. IOP should be measured three to four times per year. Normal-tension glaucoma is treated in the same way as chronic high-intraocular-pressure glaucoma. This reduces IOP to less-than-normal levels, on the theory that overly susceptible optic nerves are less likely to be damaged at lower pressures. Research underway may point to better treatments for this form of glaucoma. Attacks of acute closed-angle glaucoma are medical emergencies. IOP is rapidly lowered by successive deployment of acetazolamide, hyperosmotic agents, a topical beta-blocker, and pilocarpine. Epinephrine should not be used because it exacerbates angle closure. Vitamin C, vitamin B1 (thiamine), chromium, zinc, bilberry and rutin may reduce IOP. There is evidence that medicinal marijuana lowers IOP, too. However, marijuana has serious side effects and contains carcinogens, and any IOP-lowering medication must be taken continually to avoid optic nerve damage. Although the Food and Drug Administration (FDA) and National Institutes of Health (NIH) currently recommend against treating glaucoma with marijuana, they are supporting research to learn more about it and to determine the feasibility of separating the components that lower IOP from components that produce side effects and carcinogens. Any glaucoma patient using alternative methods to attempt to prevent optic nerve damage should also be under the care of a traditionally trained ophthalmologist or optometrist who is licensed to treat glaucoma, so that IOP and optic nerve damage can be monitored. Because glaucoma may not initially result in symptoms, the best form of prevention is to have regular eye exams. Patients with narrow angles should avoid certain medications (even over-the-counter medications, such as some cold or allergy medications). Any person who is glaucoma-susceptible (i.e. narrow angles and borderline IOPs) should read the warning labels on over-the-counter medicines and inform their physicians of products they are considering taking. Steroids may also raise IOP, so patients may need to be monitored more frequently if it is necessary to use steroids for another medical condition. Not enough is known about the underlying mechanisms of glaucoma to prevent the disease itself. However, prevention of optic nerve damage from glaucoma is essential and can be effectively accomplished when the condition is diagnosed and treated. As more is learned about the genes that cause glaucoma, it will become possible to test DNA and identify potential glaucoma victims, so they can be treated even before their IOP becomes elevated. Agonist — A drug that mimics one of the body's own molecules. Alpha-2 agonist (alpha-2 adrenergic receptor agonist) — A class of drugs that bind to and stimulate alpha-2 adrenergic receptors, causing responses similar to those of adrenaline and noradrenaline. They inhibit aqueous humor production and a have a wide variety of effects, including dry mouth, fatigue, and drowsiness. Aqueous humor — A transparent liquid, contained within the eye, that is composed of water, sugars, vitamins, proteins, and other nutrients. Betablocker (beta-adrenergic blocker) — A class of drugs that bind beta-adrenergic receptors and thereby decrease the ability of the body's own natural epinephrine to bind to those receptors, leading to inhibition of various processes in the body's sympathetic system. Betablockers can slow the heart rate, constrict airways in the lungs, lower blood pressure, and reduce aqueous secretion by ciliary tissues in the eye. Carbonic anhydrase inhibitor — A class of diuretic drugs that inhibit the enzyme carbonic anhydrase, an enzyme involved in producing bicarbonate, which is required for aqueous humor production by the ciliary tissues in the eye. Thus, inhibitors of this enzyme inhibit aqueous humor production. Some side effects are urinary frequency, kidney stones, loss of the sense of taste, depression, and anemia. Cornea — Clear, bowl-shaped structure at the front of the eye. It is located in front of the colored part of the eye (iris). The cornea lets light into the eye and partially focuses it. Gonioscope — An instrument used to examine the trabecular meshwork; consists of a magnifier and a lens equipped with mirrors, which sits on the patient's cornea. Hyperosmotic drugs — Refers to a class of drugs for glaucoma that increase the osmotic pressure in the blood, which then pulls water from the eye into the blood. Iris — The colored part of the eye just behind the cornea and in front of the lens that controls the amount of light sent to the retina. Laser cyclophotocoagulation — A procedure used for severe glaucoma in patients who have not responded well to previous treatments. The laser partially destroys the tissues that make the fluid of the eye. Laser Trabeculoplasty — In this procedure the laser attempts to open the normal drainage channels of the eye so fluid can drain more effectively. Lens (the crystalline lens) — A transparent structure in the eye that focuses light onto the retina. Miotic — A drug that causes pupils to contract. Ophthalmoscope — An instrument, with special lighting, designed to view structures in the back of the eye. Optic nerve — The nerve that carries visual messages from the retina to the brain. Prostaglandin — A group of molecules that exert local effects on a variety of processes including fluid balance, blood flow, and gastrointestinal function. Prostaglandin analogue — A class of drugs that are similar in structure and function to prostaglandin. Retina — The inner, light-sensitive layer of the eye containing rods and cones. Sclera — The tough, fibrous, white outer protective covering that surrounds the eye. Tonometry — The measurement of pressure. Trabecular meshwork — A sponge-like tissue located near the cornea and iris that functions to drain the aqueous humor from the eye into the blood. a group of diseases of the eye characterized by increased intraocular pressure, resulting in pathological changes in the optic disk and typical visual field defects, and eventually blindness if it is not treated successfully. adj., adj glauco´matous. Glaucoma strikes more than 2 per cent of all those over 40 years of age in the United States. It rarely occurs in anyone under 40. The cause is unknown, but there is a hereditary tendency toward the development of most common forms of glaucoma. Early detection and treatment are essential to prevention of permanent loss of vision. Any person over 40 with a family history of glaucoma should have his intraocular pressure checked once a year. The normal eye is filled with aqueous humor in an amount carefully regulated to maintain the shape of the eyeball. In glaucoma, the balance of this fluid is disturbed; fluid is formed more rapidly than it leaves the eye, and pressure builds up. The increased pressure damages the retina and disturbs the vision, such as by loss of side vision. If not relieved by proper treatment, the pressure will eventually damage the optic nerve, interrupting the flow of impulses and causing blindness. Classification. Glaucoma can be divided into three major types: adult primary glaucoma, secondary glaucoma, and congenital glaucoma. The most common type of adult primary glaucoma is open-angle glaucoma, in which there are “open” chamber angles but there is resistance to the outward flow of aqueous humor. This type of glaucoma, also called chronic simple glaucoma, is characterized by very few symptoms in the early stages; thus, many people have the disease without knowing it. There may be some hazy vision and mild discomfort in the eye and later there is a barely noticed loss of peripheral vision. As the disease progresses there is reduced visual acuity and greatly increased intraocular pressure that can cause the appearance of colored rings or halos around bright objects. Another form of adult primary glaucoma is angle-closure glaucoma (narrow angle glaucoma), which can be either acute or chronic. In this type of glaucoma the chamber angle is narrowed or completely closed because of forward displacement of the final roll and root of the iris against the cornea. 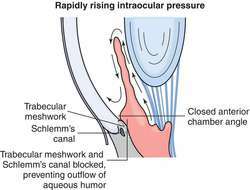 This closure obstructs the flow of aqueous humor from the eyeball and permits a buildup of pressure. Secondary glaucoma occurs as a result of a variety of disorders, such as uveitis, neoplastic disease, trauma, and degenerative changes in the eye. Congenital glaucoma is due to the defective development of the structures in and around the anterior chamber of the eye and results in impairment of the aqueous humor. Treatment. Open-angle glaucoma is treated medically through the use of beta-adrenergic blocking agents such as timolol, miotics to facilitate aqueous outflow, and carbonic anhydrase inhibitors to reduce the rate at which aqueous humor is produced. Patients must be informed about this problem and made to understand that they must continue the prescribed medications for the rest of their lives. An alternative treatment is laser photocoagulation of the angle. Angle-closure glaucoma is usually treated surgically. If it becomes acute, it is a medical and surgical emergency. If the excessive intraocular pressure is not relieved promptly by medical and surgical means, nerve fibers in the optic disk are destroyed and vision is irretrievably lost. Laser surgical techniques for relief of intraocular pressure include iridotomy and trabeculoplasty. Iridotomy involves perforation of the root of the iris, which provides an additional route for the escape of excess aqueous from the posterior to the anterior chambers and the trabecular meshwork. In trabeculoplasty the spaces of the trabecular meshwork are enlarged by a series of microscopic lesions. Eventually scars form and contract, thus widening the spaces and allowing better aqueous flow. Laser surgery can be done on an outpatient basis. A local anesthetic is used and patients feel only mild pricking sensations as the laser pulses strike and coagulate tissue. A retrobulbar anesthetic may be used to immobilize the eye during laser surgery. Patient Care. Early diagnosis and prompt treatment in order to prevent the serious consequences of increased intraocular pressure are a major concern of health care professionals. Screening techniques for early detecting include measurement of intraocular pressure in populations most at risk. Verification of the diagnosis of glaucoma is necessary once suspected cases are found. The general public should be aware of the danger signals of glaucoma and the importance of prompt and diligent treatment. All persons over 40 should have regular testing for glaucoma. Those most at risk for glaucoma are (1) diabetics, (2) persons with recently controlled hypertension, (3) African Americans (who have an incidence rate of glaucoma-related blindness that is eight times that seen in other ethnic groups), (4) those with a family history of glaucoma, (5) persons with facial hemangiomas or other nevi, and (6) victims of eye injury. Patients who already have symptoms of glaucoma and are being treated with drugs must be informed about the nature of their eye disorder, the expected effects of each medication, and the importance of faithfully following the regimen of care. Since some patients experience undesirable side effects from these medications, they are told to report them promptly so that the medications can be evaluated by the ophthalmologist. The combinations of drugs used to treat glaucoma in individual patients can vary considerably. In some cases patients may take as many as four or five drugs. They will need to know about each drug and may need help in devising a schedule for taking them. Drugs are prescribed either to enhance the outflow of aqueous or to decrease its production, or both. 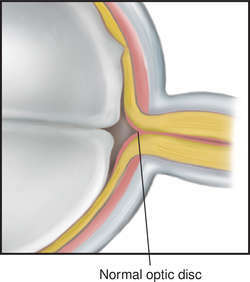 Miotic drugs such as pilocarpine facilitate aqueous outflow by stretching the iris away from the trabecular meshwork. Pilocarpine also constricts the pupil, which reduces visual acuity. epinephrine, acetazolamide, methazolamide, and the beta-adrenergic blocking agenttimolol decrease production of aqueous. Prescribed eyedrops and oral medications must be taken on an uninterrupted basis. Patients in acute care and long-term care facilities are sometimes allowed to keep their glaucoma medications at their bedsides if they are able to administer the eyedrops and medications themselves. If they are not able to do so, it is imperative that treatment for glaucoma not be neglected while caregivers are focusing their attention on more immediate medical needs of patients. Care of the patient after laser surgery is relatively simple compared with treatment after more traditional surgery. The patient may experience mild headache and blurred vision for the first 24 hours after surgery and there will be transient distortion of the pupil and a mild iritis. Topical steroids and a cycloplegic to prevent movement of the ciliary muscle may be prescribed. The patient should be told to report any sudden severe eye pain immediately and to keep all appointments for follow-up care. An elevated intraocular pressure may persist for a week or longer postoperatively and so glaucoma medications are continued until the follow-up visit and perhaps longer if intraocular pressure remains high. Glaucoma. A, in open-angle glaucoma, the obstruction occurs in the trabecular meshwork. B, in closed-angle glaucoma, the trabecular meshwork is covered by the root of the iris or adhesions between the iris and cornea. From Damjanov, 1996. (See Atlas 4, Part B). congenital glaucoma (infantile glaucoma) a congenital type that may be fully developed at birth with enlarged eyes and hazy corneas, or may develop at any time up to two or three years of age. juvenile glaucoma congenital glaucoma differing from the infantile form in that it occurs in older children and young adults, and there is no gross enlargement of the eyeball. glaucoma sim´plex glaucoma without pronounced symptoms, but attended with progressive loss of vision. (glaw-kō'mă), Avoid the mispronunciation glow-kō'mă. A disease of the eye characterized by increased intraocular pressure, excavation, and atrophy of the optic nerve; produces defects in the field of vision and eventual blindness. congenital glaucoma that due to defective development of the structures in and around the anterior chamber of the eye and resulting in impairment of aqueous humor; seen first at birth or up to age three. Donders' glaucoma advanced open-angle g.
narrow-angle glaucoma a form of primary glaucoma in an eye characterized by a shallow anterior chamber and a narrow angle, in which filtration is compromised as a result of the iris blocking the angle. open-angle glaucoma a form of primary glaucoma in an eye in which the angle of the anterior chamber remains open, but filtration is gradually diminished because of the tissues of the angle. Glaucoma. Impairment of outflow of aqueous humor is caused by closure of the anterior angle, with apposition of the iris and trabecular meshwork, in angle-closure glaucoma (A), and by other obstruction in open-angle glaucoma (B) . primary glaucoma increased intraocular pressure occurring in an eye without previous disease. Any of a group of eye diseases characterized by abnormally high intraocular fluid pressure, damage to the optic disk, and gradual loss of vision. 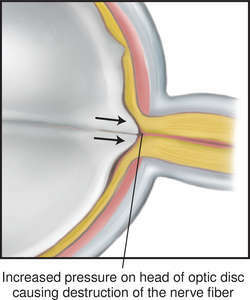 an abnormal condition of elevated pressure within an eye that occurs when aqueous production exceeds aqueous outflow, resulting in damage to the optic nerve. Acute (angle-closure, closed-angle, or narrow-angle) glaucoma occurs if the pupil in an eye with a narrow angle between the iris and cornea dilates markedly, causing obstruction of aqueous humor drainage from the anterior chamber. Primary open-angle glaucoma (POAG) is much more common in the United States and develops slowly and insidiously without a narrow angle. Peripheral visual field losses are most common, developing often without the patientÃ�?Ã�Â¢? ?s awareness until there is very serious disease. The obstruction is believed to occur within the trabecular meshworks. glaucomatous, adj. observations Acute angle-closure glaucoma is accompanied by extreme ocular pain, blurred vision, redness of the eye, and dilation of the pupil. Nausea and vomiting may occur. If untreated, acute glaucoma causes complete and permanent blindness within 2 to 5 days. Chronic open-angle glaucoma may produce no symptoms except gradual loss of peripheral vision over a period of years. Sometimes present are headaches, blurred vision, and dull pain in the eye. Cupping of the optic discs may be noted on ophthalmoscopic examination. Halos around lights and central blindness are late manifestations. Both types are characterized by elevated intraocular pressure indicated by tonometry. interventions Acute glaucoma is treated with eyedrops to constrict the pupil and draw the iris away from the cornea; osmotic agents such as mannitol or glycerol given systemically to lower intraocular pressure; acetazolamide to reduce fluid formation; and surgical iridectomy to produce a filtration pathway for aqueous humor. Chronic glaucoma can usually be controlled with eyedrops such as beta-blockers, alpha-agonists, topical carbonic anhydrase inhibitors, and prostaglandin analogs. A disease of the eye associated with increased intraocular pressure and excavation and atrophy of the optic nerve; produces defects in the visual field and may result in blindness; may be primary or secondary, acute or chronic, open or closed. A group of eye diseases characterized by increased intraocular pressure, resulting in atrophy of the optic nerve. Glaucoma causes gradual loss of peripheral vision, and ultimately, blindness. Glaucoma is the third most prevalent cause of visual impairment and blindness in the U.S, although the incidence of blindness is decreasing due to early detection and treatment. An estimated 15 million residents of the U.S. have glaucoma; of these, 150,000 have bilateral blindness. The three major categories of glaucoma are narrow- or closed-angle (acute) glaucoma, which occurs in persons whose eyes are anatomically predisposed to develop the condition; open-angle (chronic) glaucoma, in which the angle that permits the drainage of aqueous humor from the eye seems normal but functions inadequately due to overproduction of aqueous humor or outflow obstruction through the trabecular meshwork or the canal of Schlemm; and congenital glaucoma, in which intraocular pressure is increased because of an abnormal fluid drainage angle (which may result from congenital infections, Sturge-Weber syndrome, or prematurity-related retinopathy), or for an unknown reason. The increased pressure causes the globe of the eye to be enlarged, a condition known as buphthalmia. The acute type of glaucoma often is attended by acute pain. The chronic type has an insidious onset. An initial visual dysfunction is loss of the mid-peripheral field of vision. The loss of central visual acuity occurs later in the disease. See: visual field for illus. Glaucoma occurs when the aqueous humor drains from the eye too slowly to keep up with its production in the anterior chamber. Thus, narrowing or closure of the filtration angle that interferes with drainage through the canal of Schlemm causes intraocular fluid to accumulate, after which intraocular pressure increases. Glaucoma may develop, however, even if the filtration angle is normal and the canal of Schlemm appears to be functioning; the cause of this form of glaucoma is not known. Glaucoma may not cause symptoms. It is best detected early by measurements of elevated intraocular pressure (IOP), often made by adjusting the raw values that are obtained for changes in corneal thickness (as demonstrated with a pachymeter or with optical coherence tomography). A normal tonometer reading ranges from 13 to 22. The frequent need to change eyeglass prescriptions, vague visual disturbances, mild headache, and impaired dark adaptation may also be present. The standard for determining visual loss in glaucoma is the visual-field test. Open-angle glaucoma causes mild aching in the eyes, loss of peripheral vision, haloes around lights, and reduced visual acuity (esp. at night) that is uncorrected by prescription lenses. Acute angle-closure glaucoma (an ophthalmic emergency) causes excruciating unilateral pain and pressure, blurred vision, decreased visual acuity, haloes around lights, diplopia, lacrimation, and nausea and vomiting due to increased IOP. The eyes may show unilateral circumcorneal injection, conjunctival edema, a cloudy cornea, and a moderately dilated pupil that is nonreactive to light. It requires immediate treatment to reduce IOP. Acute glaucoma may be precipitated in patients with closed-angle glaucoma by dilating the pupils. 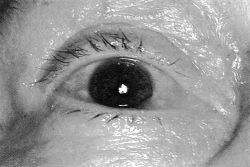 In glaucoma patients, cycloplegic drops are given only after trabeculectomy and only in the eye that had the procedure. Administering drops in an eye affected with glaucoma can precipitate an acute attack in an eye already compromised by elevated IOP. Health care providers should wash their hands thoroughly before touching the patient's eye. Prescribed topical and systemic medications are administered and evaluated. The patient is prepared physically and psychologically for diagnostic studies and surgery as indicated. If the patient has a trabeculectomy, prescribed cycloplegic drugs are administered to relax the ciliary muscle and decrease iris action, thus reducing inflammation and preventing development of adhesions. After any surgery, an eye patch and shield are applied to protect the eye, the patient is positioned with the head slightly elevated, and general safety measures geared to the patient's level of sensory alteration are instituted. Usually, the patient is encouraged to ambulate as soon as possible following surgery. Patients with glaucoma need to know that the disease can be controlled, but not cured. Fatigue, emotional upsets, excessive fluid intake, and use of antihistamines may increase IOP. Signs and symptoms such as vision changes or eye pain should be reported immediately. Both the patient and family are instructed in correct techniques for hand hygiene and eyedrop administration; the importance of adherence to the prescribed regimen; the need for regular follow-up care with an ophthalmologist; and any adverse reactions to report. Information is provided to the patient and family as needed. Referral is made to local organizations and support groups. Public education is carried out to encourage glaucoma screening for early detection of the disease. Because glaucoma is more common in African Americans than European Americans, all African Americans above age 35 (and earlier for those with a family history of glaucoma) should have an annual tonometric examination. Written information should be made available about detection and control of glaucoma. End-stage glaucoma, that is, glaucoma that produces a complete loss of vision. Upon examination, the optic nerve appears pale. Glaucoma in which the tonometer indicates an intraocular pressure reading of up to 45 or 50, the anterior ciliary veins are enlarged, the cornea is clear, the pupil is dilated, and pain is present. During attacks vision is poor. The visual field may be normal. Cupping of the optic disk is not present in the early stages. Glaucoma caused by a shallow anterior chamber and thus a narrow filtration angle through which the aqueous humor normally passes. 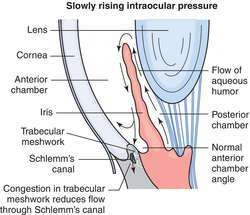 Because the rate of movement of the aqueous humor is impaired, intraocular pressure increases. In general, headache, haloes around single sources of light, blurred vision, and eye pain are symptomatic. A type of glaucoma in which intraocular pressures are normal (less than 22 mm Hg). Glaucoma produced by the dispersion of organic pigment from the zonula ciliaris to the trabecular meshwork of the eye. The most common type of glaucoma. It usually affects both eyes, and there is a characteristic change in the appearance of the optic disk. The cup (the depression in the center of the disk) is enlarged. Visual loss is determined by the visual-field test. Many patients with glaucoma have increased intraocular pressure but this is not considered essential to the diagnosis because some patients have normal intraocular pressure. Glaucoma caused by ocular trauma or an underlying disease that affects the eye. A rise in the pressure in the fluids within the eye of sufficient degree to cause internal damage and affect vision. There are several kinds of glaucoma, the commonest, chronic simple glaucoma, being almost symptomless but causing insidious and gradual narrowing of the fields of vision. Acute congestive glaucoma causes exquisite pain and sudden blinding. Subacute glaucoma causes eye-ache, misting of vision and the perception of rainbow coloured rings around lights. Glaucoma can be CONGENITAL. See also GONIOSCOPE. n a disease of the eye caused by an increase in the fluid pressure within the eyes. Initially, the disease is asymptomatic. However, as it progresses, the field of vision may decrease eventually resulting in blindness. Nutritional supplements such as vitamin C, bioflavonoids, magnesium, chromium, and fish oil may help. A progressive neuropathy which leads to retinal ganglion cell death and optic nerve atrophy. Glaucoma is characterized by optic disc cupping and visual field defects, usually associated with elevated intraocular pressure. It is commonly divided into open-angle and angle-closure types. If the cause of the glaucoma is a recognized ocular disease or injury (e.g. corneal laceration), it is called secondary, whereas if the cause is unknown it is called primary. Glaucoma is present in about 1% of the Caucasian population over the age of 40 years and about 3% over the age of 70 years, but these figures vary among different populations, tending to be lower in white populations and higher in non-white populations. See optic atrophy; glaucomatous cup; visual expander field; neuroprotection; cup-disc ratio; Marfan's syndrome; Sturge-Weber syndrome; tritanopia. absolute glaucoma Final stage of the disease which has been either untreated or unsuccessfully treated. The eye is blind and hard, the optic disc is white and the pupil dilated. acute angle-closure glaucoma (AACG) A form of raised intraocular pressure in which the pressure within the eye increases rapidly due to blockage of the trabecular meshwork. Symptoms include: intense pain, redness, blurred vision, haloes around lights, as well as nausea. Findings on examination include: reduced visual acuity, greatly elevated intraocular pressure (in the range of 40-50 mmHg), corneal epithelial oedema, semi-dilated and fixed pupil, shallow anterior chamber and mild aqueous cell and flare. Elevated intraocular pressure often causes glaucomatous optic nerve damage, as well as iris atrophy and damage to the anterior epithelial cells of the lens (glaukomflecken). Immediate treatment is imperative and includes systemic acetazolamide as well as topical medication. Surgery is often necessary. Syn. acute glaucoma; congestive glaucoma. angle-closure glaucoma (ACG) Glaucoma in which the angle of the anterior chamber is blocked by the root of the iris which is in apposition to the trabecular meshwork and thus the aqueous humour cannot reach the drainage apparatus to leave the eye. (As the blockage persists, anterior synechia may result.) This condition occurs usually in anatomically shallow anterior chambers, as is often the case in hypermetropes. Angle-closure glaucoma can either be primary (PACG) or secondary following iritis, iridocyclitis, postoperative complications, traumatic cataract, tumours, etc. Moreover, angle-closure glaucoma is divided into acute and chronic. In chronic angle-closure glaucoma (CACG) there may never be an attack but intermittent periods of increased intraocular pressure caused by progressively extensive peripheral anterior synechia. Symptoms may be absent or there may be periodic episodes of mild congestion and blurred vision. Gonioscopy is essential to differentiate this condition from open-angle glaucoma. People most at risk are females, Chinese and South-East Asian and the average age at presentation is about 60 years. Anatomical predisposing factors are pupillary block and plateau iris. Treatment of angle-closure glaucoma is essentially surgical. However, initially therapeutic agents are used including miotics, hyperosmotic agents, which cause a rapid reduction of the IOP, beta-blockers and carbonic anhydrase inhibitors. Syn. closed-angle glaucoma; narrow-angle glaucoma. A subacute form of angle-closure glaucoma may occur as a result of episodes of elevated intraocular pressure caused by anterior synechia, intermittent pupillary block, or when in a dark room. Attacks tend to resolve spontaneously but treatment with prophylactic peripheral laser iridotomy is frequently undertaken. See anisocoria; cornea plana; iridoschisis; iris bombé; plateau iris; Shaffer and Schwartz van Herick method; Smith's method; provocative test; shadow test. capsular glaucoma See pseudoexfoliation glaucoma. 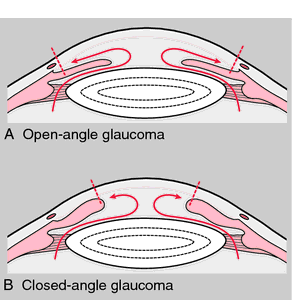 chronic glaucoma See angle-closure glaucoma; open-angle glaucoma. ciliary block glaucoma A secondary glaucoma, which occurs when aqueous fluid becomes misdirected into the vitreous cavity. The accumulating fluid then produces a displacement of the lens and iris, causing a narrowing of the anterior chamber angle with resultant raised intraocular pressure. This condition occurs most commonly following intraocular surgery, especially glaucoma surgery after the cessation of cycloplegic medications. Treatment consists of medical intervention (cycloplegics, β-adrenergic agents, carbonic anhydrase inhibitors and hyperosmotic agents) or puncture of the vitreous face with the Nd-YAG laser if medical treatment is unsuccessful. In phakic eyes, vitrectomy is sometimes required to open the anterior vitreous face. Syn. malignant glaucoma. closed-angle glaucoma See angle-closure glaucoma. compensated glaucoma See open-angle glaucoma. congenital glaucoma Glaucoma occurring with developmental anomalies that are manifest at birth and interfere with the drainage of the aqueous humour causing an increase in intraocular pressure. This in turn causes stretching of the elastic coats of the eye, enlargement of the globe as the sclera and cornea stretch, optic atrophy, marked cupping of the optic disc and loss of vision. Most noticeable is the enlargement of the cornea. Congenital glaucoma is inherited as an autosomal recessive condition with incomplete penetrance. Immediate treatment is essential. Syn. buphthalmos; hydrophthalmos; infantile glaucoma.Glaucoma occurying after the age of about three years is more often referred to as juvenile glaucoma as it follows a course similar to adult glaucoma without enlargement of the globe. See goniotomy; luxation of the lens; Peter's anomaly; Rieger's syndrome; Sturge-Weber syndrome. congestive glaucoma See angle-closure glaucoma. glaucoma detection Tests that are used to diagnose glaucoma. They are: ophthalmoscopic viewing of the optic nerve head; tonometry; visual field assessment of typical glaucomatous defects; gonioscopy to assess the width of the anterior chamber; pachometry to measure central corneal thickness and anterior chamber depth as well as providing a correction factor for applanation tonometer results; and dimensional analysis of retinal structures including the thickness and topography of the retinal nerve fibre layer (RNFL) and of the optic nerve head, assessed by scanning laser polarimetry, confocal scanning laser ophthalmoscopy, optical coherence tomography, stereoscopic photography of the optic nerve head and red-free photography of the RNFL. Glaucomatous eyes lose retinal nerve fibres with consequent reduction in layer thickness and alteration of the topography of the optic nerve head. These changes frequently precede glaucomatous visual fields losses. infantile glaucoma; juvenile glaucoma See congenital glaucoma. inflammatory glaucoma A secondary glaucoma caused by an intraocular inflammation and characterized by elevated intraocular pressure, which may be transient. The most common cause is either active anterior uveitis or following previous episodes of inflammation. Glaucoma may occur as a result of trabecular meshwork blockage due to deposits of inflammatory debris, or because of complete posterior synechia (called seclusion pupillae) blocking the flow of aqueous causing iris bombe and angle-closure, or peripheral anterior synechia. The inflammatory process is treated along with a reduction of intraocular pressure. See Fuchs' heterochromic iridocyclitis; Posner-Schlossman syndrome. low tension glaucoma See normal-tension glaucoma. narrow-angle glaucoma See angle-closure glaucoma. malignant glaucoma Elevated intraocular pressure occurring after filtration surgery for glaucoma in which the aqueous humour is diverted posteriorly pushing the vitreous body anteriorly and consequently shallowing the anterior chamber. neovascular glaucoma A secondary glaucoma due to new vessel formation on the anterior surface of the iris blocking the exit of the aqueous humour through the angle of filtration. It may occur as a result of central retinal vein occlusion (this type typically develops within three months and is sometimes called 'ninety-day glaucoma'), or diabetes mellitus. Other causes include carotid artery occlusion, central retinal artery occlusion, retinal and choroidal tumours. The condition may initially be open-angle but eventually becomes angle-closure with severe loss of visual acuity, pain, congestion, high intraocular pressure, corneal oedema, aqueous flare, synechia and severe rubeosis iridis. The presence of new blood vessels on the iris and drainage angle distinguishes this condition from primary angle-closure glaucoma. Treatment includes topical steroids to decrease the inflammation, beta-blockers and carbonic anhydrase inhibitors to lower the intraocular pressure and laser treatment of the iris neovascularization and sometimes cyclodestructive procedures (e.g. cyclodiode laser therapy). See ectropion uvea; iris neovascularization. ninety-day glaucoma See neovascular glaucoma. normal-tension glaucoma (NTG) An ocular condition in which there is a glaucomatous cupping (often accompanied by disc haemorrhages) and visual field defects with an intraocular pressure of 21 mmHg or less. It is commonly regarded as a variant of primary open-angle glaucoma and it is typically associated with cardiovascular disease or migraine. Treatment with prostaglandin analogues is usually considered the best choice but if there are progressive visual field losses surgery may be needed. Syn. low-tension glaucoma. open-angle glaucoma Glaucoma in which the angle of the anterior chamber is open and provides the aqueous humour free access to the drainage apparatus. It can occur: (1) As a primary open-angle glaucoma (POAG) (also called chronic simple glaucoma, compensated glaucoma, chronic glaucoma). The increased intraocular pressure leads to atrophy and excavation of the optic disc and typical defects of the visual field. It is the most common type of glaucoma (opinions of prevalence vary between 0.5% and 3% of the Caucasian population over 40 years and 2%-3% over the age of 70 years). Because of its insidious nature it is difficult to detect. It tends to occur more often in people after the age of 40, in people who have a family history of the disease, in African-Caribbeans, in people who have high myopia and in people who have diabetes mellitus. It is characterized by an almost complete absence of symptoms. Haloes around lights and blurring of vision occur in some patients when there has been a sudden increase in intraocular pressure or when the disease is very advanced. The diagnosis of this disease is made by demonstrating that the eye has a characteristic visual field loss (Figs. G3 and G4) and exaggerated diurnal fluctuations in intraocular pressure (>5 mmHg). POAG has been found to be caused by mutation in genes at several loci, including myocilin gene (MYOC) on chromosome 1q, optineurin gene (OPTN) on chromosome 10p, WD repeat containing protein 36 gene (WDR36) on chromosome 5q22, and others. (2) The other form is secondary open-angle glaucoma in which the intraocular pressure is elevated as a result of ocular trauma or iridocyclitis, crystalline lens abnormalities, etc. Management of open-angle glaucoma is usually by medication, unless this proves ineffective and surgery may be necessary. Formerly, pilocarpine (or carbachol) or adrenaline (epinephrine) drops were the most commonly used drugs. Nowadays,β-adrenergic blocking agents such as timolol maleate or betaxolol, which act by reducing aqueous humour formation and do not affect pupil size or accommodation, are employed as the initial treatment. Also used are the carbonic anhydrase inhibitors (e.g. acetazolamide) the α-adrenergic agonist (e.g. brimonidine), and the prostaglandin derivatives (e.g. latanoprost), which enhance the uveoscleral outflow. See optic atrophy; glaucomatous cup; ocular hypertension; plateau iris; pseudoexfoliation; baring of the blind spot; provocative test; shadow test; tunnel vision. phacolytic glaucoma An open-angle glaucoma secondary to a hypermature or mature cataract. It is due to a leakage of lens proteins into the anterior chamber that blocks the outflow of aqueous humour through the trabecular meshwork. It is characterized by an acute onset of pain and redness with high intraocular pressure. phacomorphic glaucoma A form of secondary angle-closure glaucoma in which the angle of the anterior chamber is closed due to swelling of the lens. Angle closure may be due to pupillary block or in some cases due to anterior pressure on the iris. pigmentary glaucoma A secondary open-angle glaucoma caused by pigment granules released from the posterior surface of the iris impeding the aqueous outflow through the trabecular meshwork. This type of glaucoma develops in about one-third of patients with the pigment dispersion syndrome, especially myopic males. The pigments are believed to appear as a result of a posterior bowing of the iris rubbing against the zonule. The intraocular pressure is elevated and sometimes high after a sudden release of pigment following mydriasis or strenuous physical exercise with corneal oedema, redness and haloes. Treatment is usually by medication but if this proves ineffective, surgery may be required. primary glaucoma See angle-closure glaucoma; open-angle glaucoma. pseudoexfoliation glaucoma A secondary glaucoma caused by greyish-white, flake-like basement membrane material and pigment impeding the aqueous outflow through the trabecular meshwork. It usually appears in elderly patients who present with high intraocular pressure, optic disc changes and visual field defects. It is frequently resistant to drug therapy and may require surgery (e.g. laser trabeculoplasty). Syn. capsular glaucoma. See pseudoexfoliation; pseudoexfoliation syndrome. secondary glaucoma Glaucoma occurring as a result of intraocular tumour, iritis, iridocyclitis, uveitis, rubeosis iridis, traumatic cataract, tumours, luxation of the lens, etc. See epithelial downgrowth; hyphaemia; Rieger's syndrome; ICE syndrome; pseudoexfoliation syndrome. simple glaucoma See open-angle glaucoma. glaucoma surgery See cyclodialysis; cyclodiode; filtration surgery; goniotomy; iridectomy; iridotomy; sclerectomy; deep sclerectomy; trabeculectomy; trabeculoplasty; trabeculotomy; viscocanalostomy. Eye disease associated with increased intraocular pressure and excavation and atrophy of the optic nerve; produces defects in the visual field and may result in blindness. n an abnormal condition of elevated pressure within the eye because of obstruction of the outflow of aqueous humor. n (closed-angle) a condition that occurs if the pupil in an eye with a narrow angle between the iris and cornea dilates markedly, causing the folded iris to block the exit of aqueous humor from the anterior chamber. n (open-angle) a condition that is much more common than closed-angle glaucoma and is often bilateral. Open-angle glaucoma develops slowly and is genetically determined and progressive with age. The obstruction is believed to occur within the canal of Schlemm. a group of diseases of the eye characterized by increased intraocular pressure, resulting in pathological changes in the optic disk and typical visual field defects, and eventually blindness if not treated successfully. Uncommon in domestic animals, except in dogs where several breeds are predisposed. The normal eye is filled with aqueous humor in an amount carefully regulated to maintain the shape of the eyeball. In glaucoma, the balance of this fluid is disturbed; fluid is formed more rapidly than it leaves the eye, and pressure builds up. The increased pressure damages the retina. If not relieved by proper treatment, the pressure will eventually damage the optic nerve, causing blindness. end-stage glaucoma with buphthalmos and severe degenerative changes. forward displacement of the posterior lens capsule and vitreous body with incarceration in the pupil; usually occurs after cataract surgery. one in which the iridocorneal angle is obstructed, either due to collapse or interference with drainage by the iris or connective tissue. The cause may be congenital (goniodysgenesis) or acquired, due to an abnormality of the lens, anterior chamber or iris. that due to defective development of the structures in and around the anterior chamber of the eye, and resulting in impairment of drainage. See also goniodysgenesis. a form of primary glaucoma caused by abnormal development of the iridocorneal angle. See also goniodysgenesis. a form of glaucoma in which there is no detectable abnormality of the iridocorneal angle, but drainage is obstructed by elements in the aqueous humor, luxation of the lens, or elevated episcleral venous pressure. In some cases, particularly in predisposed breeds of dogs such as beagles, no contributing factors are detectable. leakage of lens material from a hypermature cataract causes anterior uveitis that impedes aqueous outflow. increased intraocular pressure occurring in an eye with no other eye disease being present. increased intraocular pressure due to disease or injury to the eye. AOP/FODO/ABDO issued a statement to the profession this week on the glaucoma guidelines: 'The NICE guidelines provide a framework for the diagnosis and management of Chronic Open Angle Glaucoma (COAG) and Ocular Hypertension (OHT). The guidelines aim to improve the diagnosis and management of chronic open angle glaucoma (COAG) and ocular hypertension (OHT).